The indicator shows the movement of average annual air temperatures and average annual precipitation in selected areas across Slovenia in the period 1961-2007. Regular monitoring of the trend in temperatures and precipitation allows for the determination of long-term changes in the environment, preparations for newly arising conditions and mitigation of possible adverse consequences. The period 1992-2003 recorded 1996 as the coldest year and 2000 as the warmest. Particularly during the last two decades, there has been a noticeable increase in average temperatures in Slovenia, with warmest years and months being more frequently recorded in the present than was the case in the past. In 2003, Slovenia experienced an extraordinarily hot and arid summer. However, owing to appreciable differences among regions, the rise in temperatures is not distributed evenly across the country, with the lowest temperature rise recorded in the coastal region. The rise in average temperatures is also apparent on global and European scales, as well as an accumulation of above-average warm years and months within the last 25 years. Nevertheless, Slovenia is encountering even greater and more significant deviations with regard to precipitation. There are considerable differences among regions, since average annual precipitation in individual areas within the Julian Alps reach as much as 3500 mm, while towards the east, the amount of precipitation is rapidly dropping, reaching an annual average of a mere 800 mm in the easternmost part of the Prekmurje region. 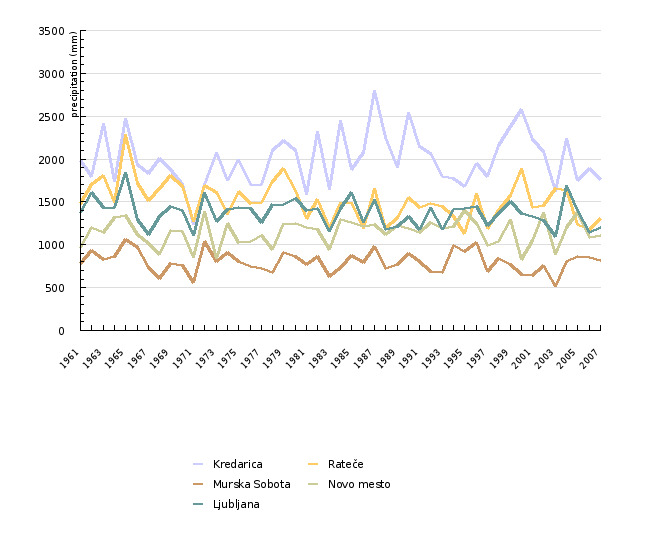 In 2000, Kredarica received the largest share of precipitation during the twelve-year period in question (1992-2003), while Prekmurje received the smallest. Furthermore, there are also apparent differences at each measuring station during the course of individual years. The coastal area reveals a trend of decreasing precipitation over the last 50 years. A similar situation is also present in the Zgornjesavska Valley; the Posočje region shows again a slight increase, while Kredarica recorded a low precipitation period in the latter half of the 1960’s and in the early 1970’s. Precipitation in Prekmurje does not reveal a distinctive trend of decreasing, at least not with regard to annual precipitation. Yet, even more troubling than the variability in annual precipitation are the deviations from average values that occur within shorter time spans (such as periods of several days, months or seasons). The consequences of precipitation deviations from normal values may be manifested as droughts, floods or landslides. Torrential floods, on the other hand, may already result from an exceptionally heavy rainfall appearing over a very short interval of time. Slovenia is therefore very likely most sensitive to climate changes in the areas that are vulnerable to the consequences of precipitation variability. With regard to precipitation considerations, Europe also expresses utmost concern over extreme weather events such as drought, intense passing showers and heavy prolonged rainfall. During recent years, several resounding instances have been recorded of all the three above listed extreme weather events, causing considerable economic damage. The heaviest was probably the toll from the massive floods sweeping across Eastern Europe in August 2002. Source of data is Meteorological Office, Environmental Agency of the Republic of Slovenia. The accuracy of measurements and the quality of data comply with the recommendations of the World Meteorological Organisation. Kredarica is representative of the conditions in mountainous regions. Rateče is a measuring station where the conditions in the area surrounding the measuring point have for decades remained unchanged; therefore this measuring station is representative of valley areas in northern Slovenia. Murska Sobota describes the climate situation in the flatlands stretching across the north-eastern part of Slovenia, where the continental climate conditions are most evident in the entire country. Novo mesto is a typical representative of the climate conditions prevailing in the Lower Carniola region (Dolenjska). 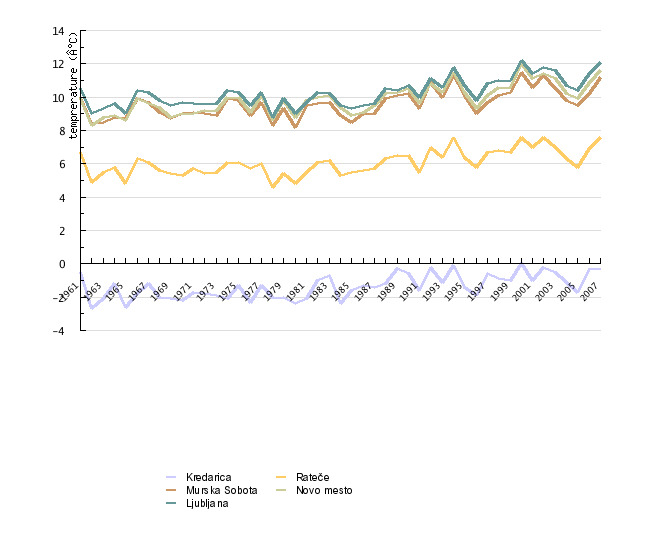 The area surrounding the measuring point in Ljubljana has undergone significant changes during recent decades; the data are nevertheless representative for the climate conditions in the city that is both the capital of and the largest city in Slovenia. Yet, it should be emphasised that these data are suitable neither for the illustration of changes in the climate conditions within a wider area nor for the assessment of changes arising directly from global climate changes. Temperatures are primarily dependent on elevation, therefore the data for Kredarica diverge most from average values; the temperatures measured at Rateče are also lower than the rest. Due to appreciable inter-year variability, which in recent years has considerably exceeded the observed trends, it is not reasonable to derive a trend based on an eleven-year series. Therefore, the conclusions are made on the basis of all data available for the past 50 years. The assessment of global trends and conditions in Europe is taken from the World Meteorological Organisation.